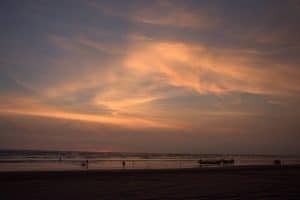 Your eyes simply cannot take in the entire length of Playa Novillero Beach in Novillero Mexico, the longest beach not only in Riviera Nayarit, but also in the entire country. It is more than just the longest beach in Mexico however, it is also among the Top 5 longest beaches in the entire world! Just how long is Playa Novillero Beach in Novillero Mexico? Stretching for almost 90 kilometers (56 miles) and measuring almost half a kilometer (a third of a mile) wide, the fine sand beach of Playa Novillero Mexico is stunning with its tranquil waters. In places, this beach literally invites you to walk out into open Pacific Ocean waters for almost 100 meters (328 feet). This is undoubtably one of the state’s best must-see Nayarit destinations. It is common to see groups of young adults and adolescents enjoying themselves in the surf and entire families gathered together to prepare a feast on the ocean shore. Thanks to its natural gifts, the beach at Novillero Mexico is also one of the safest in the state of Riviera Nayarit, making it ideal for children and inexperienced swimmers to venture out into the tranquil warm waves. Other natural Nayarit activities and attractions located near Playa Novillero beach include The Cuautla Canal and Brava Lake. You can visit by boat on a tour to observe the mangroves, which is home to a wide variety of resident and migratory birds. Playa Novillero Mexico weather ranges from 75-90°F (24-32°C) in summer months and between 60-77°F (16-25°C) in winter months. The rainy season runs from July to September with the most rainy days in August. Don’t let the “rainy season” in Novillero Mexico discourage you, as weather in Playa Novillero Nayarit in the rainiest month of August means just 6 days of rain for a total of just 9 mm of precipitation. Playa Novillero Mexico is located in the northern part of Riviera Nayarit in the township of Tecuala. Nearby Playa Novillero Nayarit hotels are in the neighboring towns of Tecuala and Acaponeta. San Blas Mexico is just 164 km away, and the distance from Novillero Mexico to Nuevo Vallarta is approximately 4 hours or 312 kilometers, but well worth the drive!